I can’t bear to talk about the past today because I am too filled with despair about the future. I have spent the day mourning the election results and reaching out to others who shared my desolation. I have found myself again and again in tears, sometimes tears of grief for what has happened to our country, sometimes tears of relief when someone has touched me with words of comfort or hope. 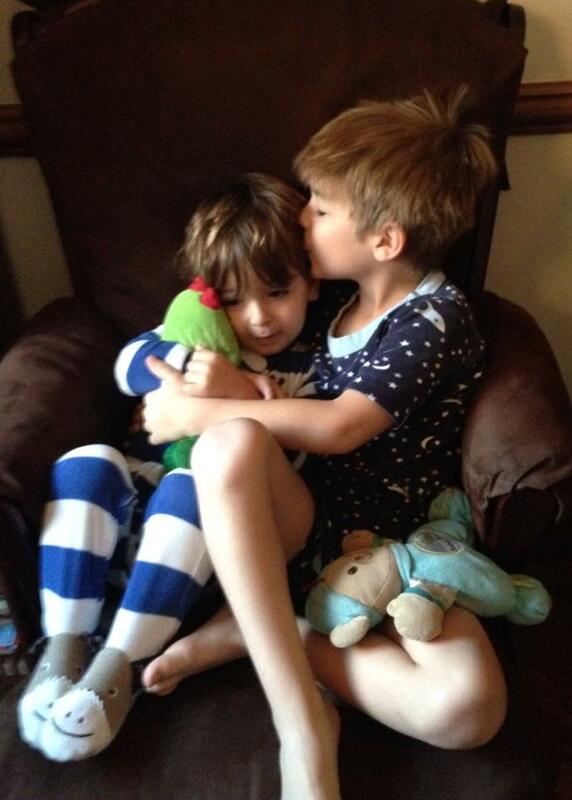 In the aftermath of the election results, my daughter shared this photograph of my grandsons. It made me smile and cry. It represents all my hopes and all my fears. I have gone through at least the first few stages of grief—shock and denial, anger, and now depression. (I skipped over bargaining, although I did find myself last night saying I’d accept a tie in the Electoral College). I am devastated. Don’t tell me it will all be okay. Don’t tell me to unite behind Trump. It won’t, and I won’t. I am devastated for my daughters and all the women who believed that America would elect a highly qualified woman over an inexperienced and ignorant man. I am devastated for all in the LGBTQ community who must see the progress of recent years hanging by a thread. I am devastated for all people of color, all immigrants, all Muslims, who must feel even more frightened than I do. I am devastated for those who will see their health insurance disappear. I am devastated for our planet, which will now see nothing done about climate change. I am devastated that nothing will be done about gun violence. I could go on. But mostly I am devastated that my grandsons live in a country filled with so much hate and ignorance. They say the next stage of grief is acceptance. I won’t get to that one. What I hope I can get to is action to fight acceptance. We need people to unite against these forces of darkness, to work together to protect the rights of those who are most vulnerable, to preserve our rights to choice and to healthcare, to work to protect our planet and the values of free speech, freedom of religion, and freedom from discrimination. I fear we will instead drift into acceptance. I admit that I have no idea how we start this movement. I am hoping that someone with more skills and experience than I have will get us mobilized. Perhaps it will be some of those who felt the Bern, perhaps some of those who fought so hard for Hillary. Or perhaps it will be someone entirely new. I want to be a part of whatever it takes to make this country a place where those two little boys pictured above and all those who come after them can grow up without fear and filled with love and hope and acceptance of all people. Where everyone can, regardless of race, religion, sexual orientation, gender, nationality, age, or disability. As my husband said, our ancestors didn’t come here so that we could give up on our dreams. We need to mourn first and then pick ourselves up and fight for what we believe. This entry was posted in Reflections and tagged 2016 election. HIllary Clinton, Barack Obama, Bernie Sanders by Amy. Bookmark the permalink. Amy, I totally feel the same way! There is a movement, look for Pantsuit Nation on FB so many there looking to make the change and figuring out how they are going to do it. Thank you. I am already a member. Things seem quiet today, understandably, but I will be following to see what happens as the wounds heal a bit and we start to mobilize. Dear Amy, as a family historian and a Canadian with immigrant ancestors, I want to say that my heart goes out to you. Thank you for writing such a clear statement and for expressing hope for the future. Thank you, Carolyn. I know no nation is perfect, but right now Canada looks awfully appealing. Thank you, Amy. Canada may look appealing at the moment, but many of us here also fear the repercussions of this election result. Regardless, among all my friends and colleagues (family historians and translators), your blog post was the most eloquent and hopeful response I encountered. I would like to share it with a few of my American colleagues, on an individual basis, by email, but only with your permission. All the very best to you. Well, thank you, Carolyn. It came straight from the heart—one of the few that I didn’t edit over and over. Sometimes when we write from our emotions, we express ourselves best. And yes, of course, please feel free to share this with anyone you like. We all need to be connected! Very brave post in light of so many fractions of views to last nights results with so many in our country believing in this new era ready to begin in our history. It’s odd Amy, for me I am drawn closer to the cry of the 60’s and the feeling of hopeless ness, the reality of the inability to have made change; echo’s of turn on, tune in and drop out fills my head today and the feeling I sure would love to, but whats even worse for me is 5 grown daughters now and spouses, 13 grands some with spouses already, to many of them that don’t see and believe what I see and believe. My question to me is how could that happen, how could some of them join in on this band wagon that swept the country? I don’t think it was brave. I don’t care what “they” think; I am too angry. And fortunately or not, I live in a bubble here in MA. Not one of my friends voted for Trump. None of my close family did either. We are all just as mystified, depressed, and angry. If I didn’t say what I said, I would feel even worse, letting the voices of hate and anger silence me. Thanks, Sharon. I feel the same way. Your FB posts are very similar to mine from last night and today. [I do know people who voted for Trump and cannot understand how the person(s) I know made that choice (well I know what they said but that isn’t who I thought they were). It’s been a very depressing day. But I will pick myself up and continue to fight for the world I believe in. Strength to you and yours. Thank you, Jo. I think we all need to hear from others who share our values now so that we don’t feel as desolate. And, to be honest, I could not be friends right now with anyone who voted for Trump. Maybe I will forgive them at some point, but not right now. I am too angry and too sad. Oh Amy, I read your post with tears in my eyes. I feel as you do, and even though I’m half a world away, I can’t help but fear for all our futures. None of my family lives in the US, but those friends who do are suffering and feeling like you. My heart goes out to them and to you. I want to keep believing in the essential goodness of humanity and I hope that in the weeks and months to come groups and movements will emerge and grow to help stem the tide of fear and hatred. Kia Kaha my friend. Nga mihi nui. Thank you, Su. My 86 year old mother said that if she were younger, she’d move to NZ. We all feel like escaping somewhere right now, but we are also captive to the place where our jobs are and our families. I can only hope, as you said, that those of us who care about progressive values will bond together and fight for justice, tolerance, and peace. Now you can translate the last few words for me? Thanks! “Stand strong. Sending my best wishes”. Sorry I use them so often, I forget to translate. New Zealand is not paradise; if fear and ignorance can take hold in the UK with Brexit and in your election, they can also prevail here sadly. Australia has already shown its ugly face in the treatment of asylum-seekers. Of course, no place is paradise. But NZ comes close to LOOKING like it anyway. Thanks for the translation and the sentiments, Su. Thanks Amy. It is still a very good place to live, and I guess if we here have something to learn it is that we must never take that for granted. Thinking of you. Europe is in shock and we are scared. As am I. Of course, we’ve seen similar trends across the world—in England, in France, the anti-immigrant movement. There’s just a serious tide of intolerance, xenophobia, and closed-mindedness sweeping the world. And yes, it is frightening. Just keep putting one foot in front of the other, we all have much work to do. A battle may have been lost and more to come I am sure but all of us must keep faith that our efforts will be for the greater good. I am trying. Today at least I got up and went outside. And yes, we have to keep on fighting for progress. Thank you. I feel your pain and anguish. Living in the Midwest, I have a two-sided vision of the USA. My NJ background aligns me to the coast, but living here for 36 years opens my eyes to middle America. I told my sister in October that I was very worried. That in the midwest even educated people were supporting Trump. But I am resolute that this will not be a country of hatred. That we all must work together. Remember more people for Hilary than for Trump. Thanks, Ellen. I know I live in a bubble. And it infuriates me that once again the electoral college has led to the wrong candidate being elected. It’s time to change that, but more important is to work for progress. I’m full of grief too. My stomach was turning and my head spinning. And I agree that the Electoral College has out lived its purpose. Three of my four grandparents came from Europe, and the fourth born in the USA to Irish parents, for a better life. It is hard to take. We will carry on the march for change. Thank you, Maryann. Every person who reaches out and shares their own frustration and grief gives me hope for change. I’ve been numb since Tuesday. What you wrote above hit the nail on the head. I completely agree. The one image, above all others, that I could not erase from my mind as we all voted was Trump making fun of the disabled reporter. It makes me want to vomit. When I think of Trump, that is all I see. He showed us who he is, time and time again, yet he was voted in; those who support him overlook those behaviors. I am horrified today as I watch videos in schools where white children chant “Build the Wall!” Golly, wonder where they learned that! It is beyond baffling, not to mention hurtful and divisive. But, we MUST find a way to live peaceably. Like you, I have no clue how to do that. I am hoping those with better skills than I come together to start the long and painful process to put us back together. I’ve never been afraid after an election. I am now. Everything you said reflects all my own feelings and fears. Let’s all try and find a way to fight against these forces of hate and evil. Together we outnumber those people, and if we are persistent, we can prevail. Very frightening (from across the pond) that somehow this wickedness has crept in. Indeed. I am not sure how those who opposed Brexit felt when those results came in, but I would imagine there was at least some of the similar grief, anger, and fear. across Europe. We fear the impact of the change. I wholeheartedly share your sentiments about the US election. Somehow the forces of light will find a way to prevail over darkness. I hope. Amy – thank you for sharing your thoughts, you are not alone. We are worried but we will all fight for our values and for our safety. Thanks–and yes, we must do that. Thanks for your thoughts, Frederick, though I see none of those signs. He will appoint someone to the Supreme Court who will try and nullify a woman’s right to choose and marriage equality. He has selected someone who doesn’t believe in climate change for our environmental policy. His chief policy director is a known anti-Semite. His potential attorney general is a man who treated homeless people as if they had no civil rights. You are deluding yourself if you think he will not be a danger to the rest of the world with his impulsiveness and ignorance and closed-mindedness. And so far most of his advisers are insiders, not outsiders; so much for “clearing the swamp.” Maybe it won’t be the apocalypse, but for those of us with progressive values, it will be some version of hell. I know I am late to respond but I have been meaning to reach out to you since this terrible election. We know personally the outcome of having men like Trump in power. I have not been able to stop grieving but I am now starting to mobilize to keep this from happening again. Trump’s new appointments do not ease my fears at all. I am reaching out across the internet to you and affirming that ours is a family who never stops fighting. I know it is hard and we get tired but we must never stop. We owe it to those who came before us and to those who come after us. Stay the course my dear cousin and know that I will do the same. Davita, it is so good to hear from you, and I hope you are otherwise well. Thank you for reaching out. Yes, we have to keep fighting and keep hoping that justice will prevail. Our pioneer ancestors who came from Germany to New Mexico so long ago would want to see their dream of America preserved. Thanks again for reaching out!